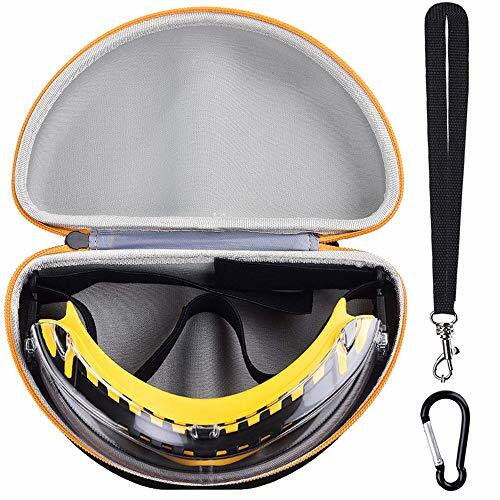 This amazing case for your DEWALT DPG82-11/DPG82-21 Goggle, you have to give it a shot! +Totally Tailored for your DEWALT DPG82-11 Goggle, so it fits perfect! +Tough Exterior protects your glass from bumps and jostles. +Soft Lining Layer keeps it free of scratches. +Sturdy Hand Strap makes transportation easy and convenient, so you can take it easily! 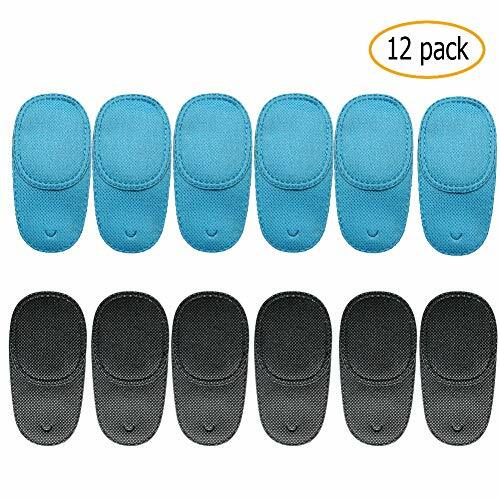 +Smooth but Strong Zipper gives you a better using experience. 360 Zip is convenient for you to put it in and out the case. Case is made of superior Hard EVA for durability. Keeps it 100% safe. +If your friend also has this glass, its simple but very fashionable design makes it a great gift idea. We offer Full Refund if there are quality problems. NOTE: The glass is not included. Risk-free Purchase: Totally tailored for your DEWALT DPG82-11/DPG82-21 Goggle and we offer 100% Money back Guarantee If there are quality problems. Safety Guarantee: Hard EVA Material is Shockproof Dustproof and Waterproof to protect your DEWALT DPG82-11 Goggle from impacts and splashes. Super Convenient: Comes with comfortable hand strap to carry easily and roomy to contain other small accessories. Luxury and Fashionable: Build-in super quality villus reflects superior taste and ensures a long-lasting performance. Considerable Design: Smooth but strong zipper gives you a better using experience. 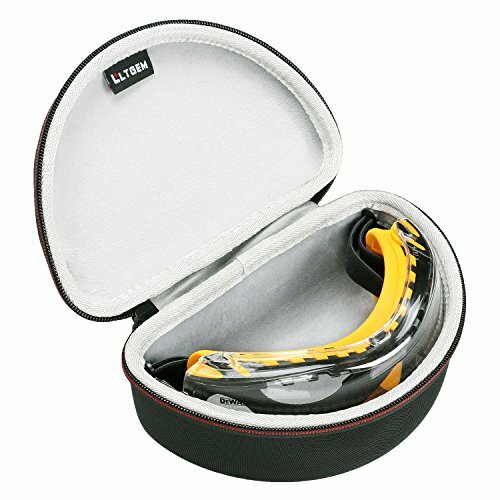 360 Zip is convenient for you to put your glass in and out the case. 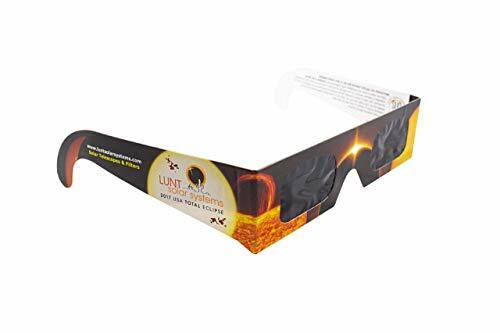 Lunt Solar Eclipse Glasses are ideal for viewing the partial phases of an Eclipse. 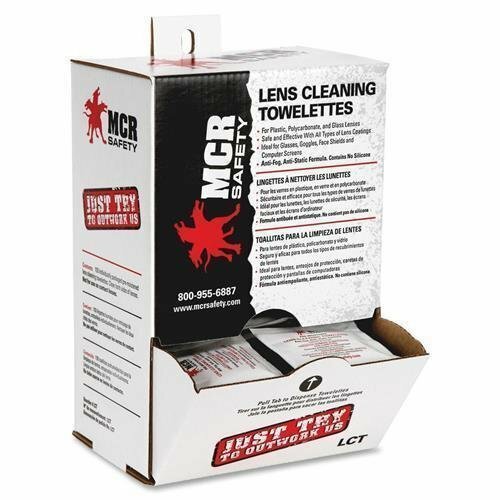 BEFORE EACH USE: Check front and back of each lens for damage such as scratches, pinholes or separation from frame. If damaged, cut into small pieces and discard. DO NOT attempt to clean or disinfect (under general conditions of use this should not be necessary). INSTRUCTIONS FOR USE: Wear your Eclipse Glasses to protect your eyes from solar radiation any time you look directly at the Sun or the Sun's reflection. When looking at a solar eclipse, use your Eclipse Glasses whenever ANY PART of the Sun, no matter how small, is visible. This product should not be used with any other optical appliances such as cameras, telescopes or binoculars. This product is NOT a toy. Children should use only with adult supervision. WARNING: NEVER LOOK AT THE SUN WITHOUT SPECIAL EYE PROTECTION. DO NOT USED IF DAMAGED. Using damaged Eclipse Glasses can result in severe eye injury. Our Eclipse Glasses are absolutely safe for direct viewing of the sun and solar eclipses. Lunt Solar Eclipse Glasses are manufactured in Germany and are 100% safe for direct viewing of the Sun and Solar Eclipses. Protect your eyes. Lunt Eclipse Glasses filter out 100% of harmful ultra-violet, 100% of harmful infrared, and 99.999% of intense visible light. These premium filters create a sharp orange-colored image of the sun. Perfect for viewing the 2019 South American Eclipse in Chile and Argentina. The Jackson Safety INSIGHT Clear Safety Plates are a must-have accessory for the Insight Variable Auto Darkening Welding Cartridge and Welding Helmets. 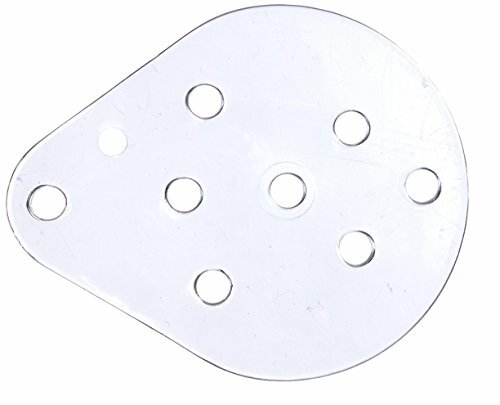 To help prevent surface damage to welding filter plates and auto-darkening lenses, clear safety plates should always be inserted in front for protection. 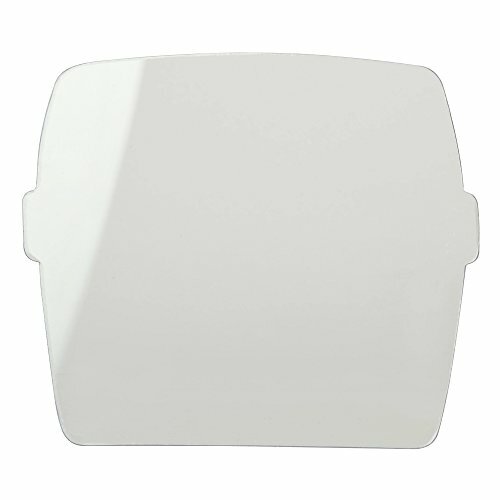 Vision Aid flex side shields are designed for maximum softness and pliability to easily slide through the temple. These impact-resistant, protective Goggles allow temples to fold correctly and require no parts or tools for assembly. 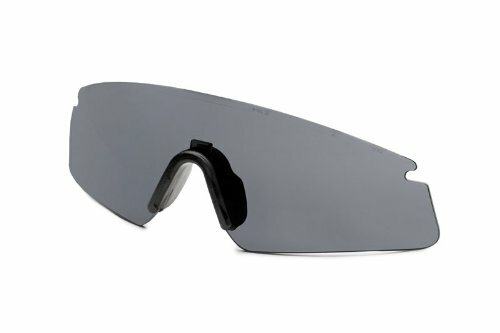 Vision Aid flexible side shields meet ANSI Z87.1-2003 standards and provide 100 percent UV protection. UV protectant side shields are packaged 60 pairs/box; 600 pairs/case. Due to high demand of eclipse glasses the number of styles may vary from 3-5 and may include a plain white style to make up the 10pk. ECLIPSE GLASSES will allow you to safely view the total solar eclipse happening on Aug 21, 2017. American Paper Optics is your safest and best bet when it comes to purchasing the right set of eclipse glasses. Overview:- you are looking At the highest quality solar Eclipse glasses for this price range on amazon! 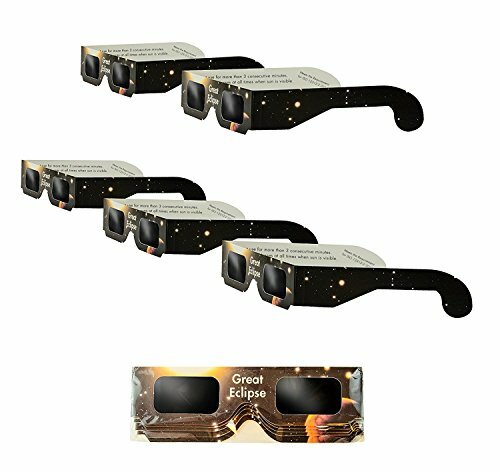 - The great Eclipse solar Eclipse glasses are made to have a direct view of the great American Eclipse at a value price. - We are confident you will love these solar glasses for use during the August 21, 2017 eclipse! Features: these solar glasses includes features like: safety Certified - our solar glasses are CE certified to guarantee safety when viewing UV rays for extended periods of time effective viewing - fulfills strict ISO standards. They have an optical density 5, and the film has Black under coating for maximal protection and proper colors while viewing great American Eclipse edition - mark your calendars now for August 21, 2017! The views are going to be amazing, You don't want to miss it!5 pack - to cut cost, save shipping time, and share with friends! Thank you! For you business.About our business: great Eclipse is a collaborative and energetic business that is customer service oriented. Our staff has years of experience handling quality control, logistics, and customer relations. We know that we can provide a service unmatched by any competitors. Supporting great Eclipse means supporting a business that has goals greater than itself, run by a staff that is motivated and driven to serve you! Specifically developed for severe temperatures, the Desert Locust Extreme Weather Goggle provides best-in-class comfort and fog resistance for extreme environments. The dual-pane thermal lens and proprietary OcuMax coating keep fog and surface scratches at bay, while comfort foam seals elements from the eyes. Like all Desert Locust products, the optically correct goggle lenses are interchangeable and engineered for maximum field-of-view. On U.S. Army Authorized Protective Eyewear List. Iso and CE rated safe for everybody. We've had our glasses laboratory tested. 100% safe to watch the eclipse this August. Your safety is important to us. View the solar eclipse totally safely. Look at the sun directly with these solar eclipse glasses and don't miss this once in a life time experience. Adult size our glasses are about the same size as a standard pair of adults sunglasses. Stylish and trending design much better looking than the paper glasses. 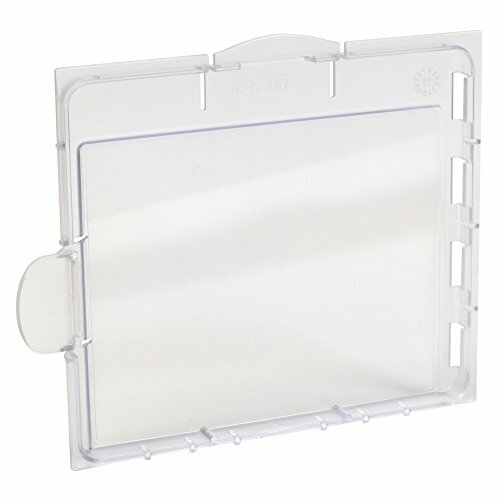 Ventilated clear acrylic shield with " openings for tape attachments. Ideal for use after surgery. Accommodates either eye. Made in U.S.A.
-Made of premium material.Pretty Soft, breathable and Comfortable. These are non-sticky eye patches, just slide one patch on over the glass stem and wrap it around to cover the lens,There is a hole that can be fixed on the glasses,convenient to use,Especially no need to adhesive to your kids eyes , No irritate and pull at skin . Note: please check the size of patches to see whether it can fit your eye glasses frame before ordering. Special light protection inlay assures maximum shielding from light.it can be washed repeatedly used, easy to remove and wash.
* It is a pair of glasses ear socks. * Fit For Oakley Glasses Model CROSSLINK PRO SWEEP SWITHC OX8027 OX8029 OX8030 OX8031 OX8033 OX3128 OX3149 OX3150 OX8090 OX8118 etc. * Installation is very convenient: In the mirror legs tail rub point detergent lubrication, and then slowly squeezed into the way of. It is a pair of glasses ear socks. 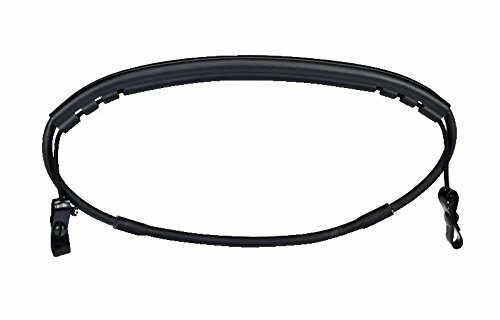 Fit For Oakley Glasses Model CROSSLINK PRO SWEEP SWITHC OX8027 OX8029 OX8030 OX8031 OX8033 OX3128 OX3149 OX3150 OX8090 OX8118 etc. Installation is very convenient: In the mirror legs tail rub point detergent lubrication, and then slowly squeezed into the way of. When you care enough about your welding to select the top Jackson Safety SmarTIGer Welding Helmet with Balder Technology, you want to protect your investment with the Jackson Safety SmarTIGer External Safety Plates. The clear plates cover the outside of the ADF, helping protect it from surface damage from flying debris and sparks. These lenses are designed to be sufficiently large enough to cover a variety of eyeglasses, cover gaps and minimize peripheral light leakage. HOWEVER, these will ONLY fit for eyeglasses that are LESS than these dimensions: Lens Dimensions: 2.36 in X 1.6 in or 60mm X 41mm *Your glasses lens CANNOT be bigger than this. POLARIZING Technology These polarized lenses will enhance Driving safety and overall vision by reducing reflections and glare on the road and from other cars. May also be used to reduce water reflection for Fishing experience by letting you see through the water better. *Easy to clip on to any regular glasses*. To offer the best service, value, and selection possible to our customers. UV400 Lens Technology -absorbing over 99%of harmful UVA&UVB spectrums. 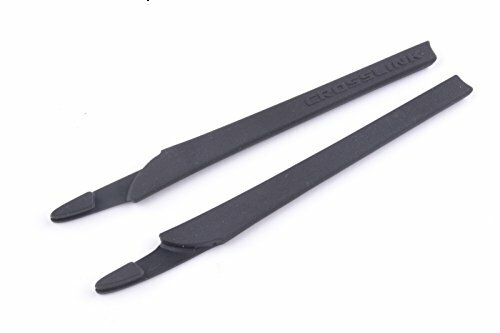 Metal clip & rubber cover on each leg ---The clip is forged by premium metal material and with rubber cover on each leg ---Provides you a durable, sturdy and protective product. Polarized lenses ---Improve your vision, reduce glare, and sharpen your eye sight. 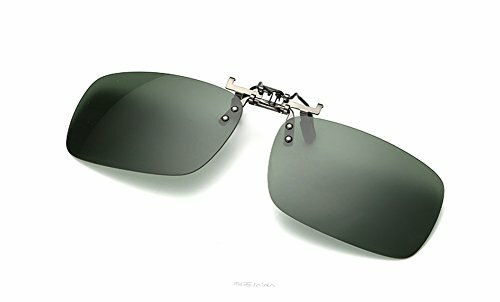 Easy to clip on most of regular glasses. Any defective product will be full refunded. Please contact with us. - SAFETY FIRST - NASA APPROVED!!! They meet the ISO 12312-2 safety standard for filters for eyes-only direct viewing of the Sun. We have met all of Amazon's safety requirements. 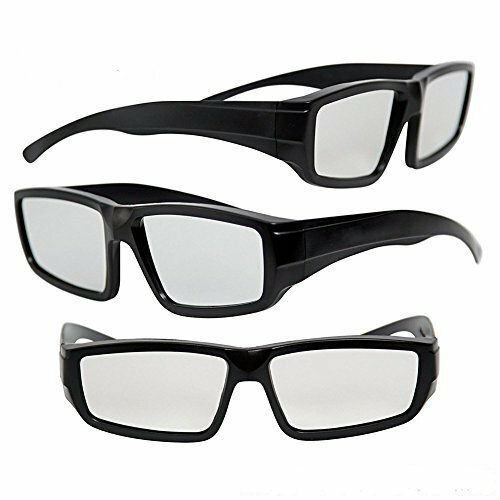 Unlike cheap knockoffs, you won't have to worry about eye safety with these high quality glasses. 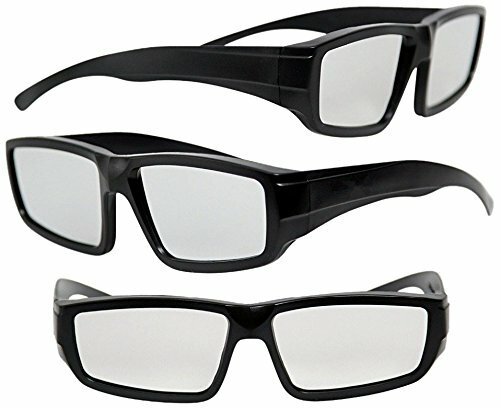 These glasses will filter 100% of harmful ultra-violet, 100% of harmful infrared, and 99.999% of intense visible light. Looking directly at the sun without protection can cause Blindness. - OPTIMIZED FOR MAXIMUM VIEWING PLEASURE - These eclipse viewing glasses are manufactured exclusively with scratch resistant Black and Silver Polymer material and have an optical density of 5 or greater. This ensures that you will have the best viewing experience. Fits easily and comfortably kids and adults. Folds up flat for convenient carrying and storing. 100% SATISFACTION GUARANTEED!!! - BE PREPARED FOR THE TOTAL SOLAR ECLIPSE OF 2017 - Make a once in a lifetime memory with friends and family as you watch the first total solar eclipse in the USA in 38 years with CPPSLEE solar eclipse glasses. These will act as a souvenir to represent how YOU experienced the solar eclipse. - THE GRANDDADDY OF THEM ALL - a 2.5 minute 60 mile wide MIND BLOWING TOTAL ECLIPSE BLACKOUT will pass America from Coast to Coast. Oregon's West Coast to South Carolina's East Coast!!! Experts predict this will be the most watched Total Solar Eclipse in History!!! Get to the path of TOTALITY days before the event! All of Canada, USA and Mexico will have at least a 50% Partail Solar Eclipse!!! WOW! - CPPSLEE ISO AND CE RATED - Safe for all the family we have had our glasses laboratory tested and are ISO 12312-2 2015 approved so you know you are 100% safe we viewing the eclipse this August. Please identify CPPSLEE and the other sellers are not safe. 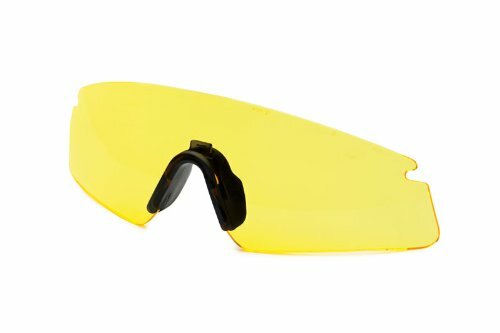 SAFETY PROTECTIVE GLASSES - NASA APPROVED and CE & ISO Certified to remove 100% of infrared rays, ultra - violet rays, and 99.99% of intense visible light. We have met all of Amazon's safety requirements. Viewers can watch this rare phenomenon safely, without harmful ray issues. VIEW THE SOLAR ECLIPSE SAFELY - View the sun directly with these eclipse glasses and don't miss this once in a life time experience. BEST VIEWON EXPERIENCE - can be used to look at the sun off mountains or wherever also good for solar eclipse glasses, crisp clearest orange image ensures that you will have the best viewing experience. STYLISH AND COOL DESIGN - Much cooler looking than the paper glasses. Perfect for the image conscious eclipse viewer. When you want to protect your Jackson Safety TrueSight II Digital ADF Welding Helmet, you need Jackson Safety TrueSight II Internal Safety Lens. The clear safety lens helps protect the auto-darkening lens by helping absorb sparks, smoke and impact. Make sure you have an internal and external safety lens to help extend the life of your ADF. You can trust Jackson Safety to provide welding tools to live up to your standards. Features: * Great for students or professional use. * Good quality and durable. * Lightweight. * Our optical trial frames are all brand new from factory. 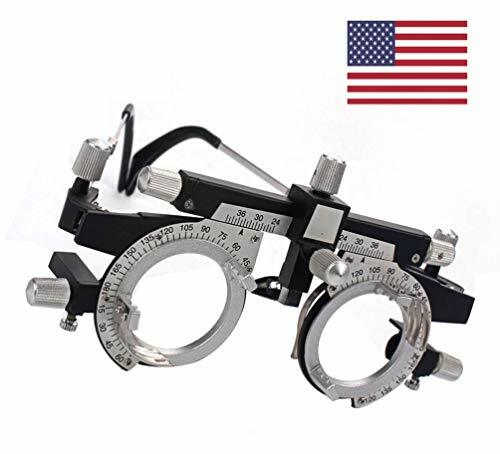 Great Quality Professional Optometry Titanium Optical Trial Lens Frame. Holds up to 8 lenses (4 pairs), with standard diameter of 38 mm. Easy PD adjustment for both eyes with range of PD adjustments of both eyes: 48 ~ 80 mm. Domestic delivery within US will take 2-5 working days.